Not to be confused with Homework, House Work, or House-building. Homemaking is a mainly American term for the management of a home, otherwise known as housework, housekeeping, or household management. It is the act of overseeing the organizational, day-to-day operations of a house or estate, and the managing of other domestic concerns. A person in charge of the homemaking, who is not employed outside the home, is in the United States is called a homemaker, a term for a housewife or a househusband. The term "homemaker", however, may also refer to a social worker who manages a household during the incapacity of the housewife or househusband. Housework is not always a lifetime commitment; many, for economic or personal reasons, return to the workplace. In previous decades, there were a number of mandatory courses for the young to learn the skills of homemaking. In high school, courses included cooking, nutrition, home economics, family and consumer science (FACS), and food and cooking hygiene. More recently, most of these courses have been abolished, and many youths in high school and college would likely study child development and the management of children's behavior. Early nineteenth-century ideals required homemaking be the responsibility of the woman; “the wife is properly supposed to be the light and centre of the home.”  Traditional wives who stayed home and did not work were required by social ideals to create and maintain a peaceful space to provide to her husband and children. For women in a pre-modern environment, “it is the duty and privilege and solemn responsibility, which make this art of home-making more interesting and important to her than any other art in the world.”  Author of these statements, Annie Swan was not alone in the late 1800s viewpoint that women were encouraged, if not required, to maintain the home solely themselves. In 1875, Harper’s Bazaar published an article outlining the duties of a housewife and the esteemed respect those duties deserve: “but if one only staid to think how countless and how onerous those duties really are, more respect would be paid to the faithful effort to perform the, and an added reverence extended to the mother who is also the housekeeper.” Although Harper’s Bazaar recognizes that women do the majority of the work within the home, the article suggests that the work is detailed and at many times, difficult. In contrast, a study performed by Hochschild in 1989, concluded that even when married wives who contributed more than 50% of the household income often still performed more household labor than their husbands. Hochschild’s study directly debunked the previous theory that women performed housework because they contributed significantly less to household income. Instead, the results of the study indicated that even in marriage dynamics where women contributed more than half of the household income, they still completed the vast majority of homemaking tasks. Interestingly enough, married women who are economically and emotionally dependent on their husbands are less likely to report the division of household labor as unfair. This significant group of married women felt that household labor reinforced their female gender identity and connection to femininity. According to a 2015 survey of American Households by the Bureau of Labor Statistics, over 50% of women are ultimately the majority of the housework. Men reported doing housework – such as cleaning or doing laundry. On an average day, women spent almost an hour more on doing household activities than did men. Women spent more than twice as much time preparing food and drink and doing interior cleaning, and over three times as much time doing laundry as did men. Men spent more than twice as much time doing activities related to lawn, garden, and houseplants, including interior and exterior maintenance, repairs, and decoration as did women. In modern marriages, the division of labor within the context of marriage very much still unevenly distributed. However, both parties contribute significantly to the creation and maintenance of the home. Recent results of the 2004 U.S. Census Bureau concluded that on average married women spent 19 hours on housework per week and married men spent an average of 10 hours per week. Anthropologist, Coltrane, discovered that the unequal distribution in housework was attributed mainly to time availability. He concludes: “wives typically work fewer hours than their husbands, [so] they have more time available to perform household tasks.” With wives coming home sooner, they is more of an opportunity to contribute to maintaining and keeping of the home. Housekeeping by the homemaker is the care and control of property, ensuring its maintenance and proper use and appearance. A home is a place of residence. In a private home a maid or housekeeper might be employed to do some of the housekeeping. Housework is work done by the act of housekeeping. Some housekeeping is housecleaning and some housekeeping is home chores. Home chores are housework that needs to be done at regular intervals, Housekeeping includes the budget and control of expenditures, preparing meals and buying food, paying the heat bill, and cleaning the house. Most modern-day houses contain sanitary facilities and a means of preparing food. A kitchen is a room or part of a room used by the Homemaker for cooking, food preparation and food preservation. In the West, a modern kitchen is typically equipped with a stove, an oven, a sink with hot and cold running water, a refrigerator and kitchen cabinets. Many homemakers use a microwave oven, a dishwasher and other electric appliances like blender and convection cooker and automatic appliances like rotimatic and automatic cookers. The main function of a kitchen is cooking or preparing food but it may also be used for dining and entertaining. Cooking is the process of preparing food with or without heat, making and selecting, measuring and combining ingredients in an ordered procedure for producing safe and edible food. The process encompasses a vast range of methods, tools and combinations of ingredients to alter the flavor, appearance, texture, or digestibility of food. Factors affecting the final outcome include the variability of ingredients, ambient conditions, tools, and the skill of the individual doing the actual cooking. The diversity of cooking worldwide is a reflection of the aesthetic, agricultural, economic, cultural, social and religious diversity throughout the nations, races, creeds and tribes across the globe. Applying heat to a food usually, though not always, chemically transforms it, thus changing its flavor, texture, consistency, appearance, and nutritional properties. Methods of cooking that involve the boiling of liquid in a receptacle have been practised at least since the 10th millennium BC, with the introduction of pottery. Housecleaning by the homemaker is the systematic process of making a home neat and clean. This may be applied more broadly that just an individual home, or as a metaphor for a similar "clean up" process applied elsewhere such as a procedural reform. In the process of housecleaning general cleaning activities are completed, such as disposing of rubbish, storing of belongings in regular places, cleaning dirty surfaces, dusting and vacuuming. The details of this are various and complicated enough that many books have been published on the subject. How-to sites on the internet have many articles on housecleaning. Tools include the vacuum cleaner, broom and mop. Supplies such as cleaning solutions and sponges are sold in grocery stores and elsewhere. Professional cleaners can be hired for less frequent or specialist tasks such as cleaning blinds, rugs, and sofas. Professional services are also offered for the basic tasks. Safety is a consideration because some cleaning products are toxic and some cleaning tasks are physically demanding. Green cleaning refers to cleaning without causing pollution. The history of housecleaning has links to the advancement of technology. Outdoor housecleaning chores include removing leaves from rain gutters, washing windows, sweeping doormats, cleaning the pool, putting away lawn furniture, and taking out the trash. Laundry refers to the act of washing clothing and linens, the place where that washing is done, and/or that which needs to be, is being, or has been laundered. Various chemicals may be used to increase the solvent power of water, such as the compounds in soaproot or yucca-root used by Native American tribes. Soap, a compound made from lye (from wood-ash) and fat, is an ancient and very common laundry aid. 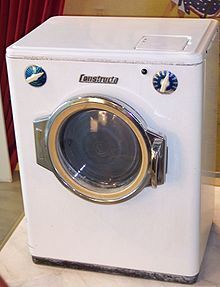 Modern washing machines typically use powdered or liquid laundry detergent in place of more traditional soap. Once clean, the clothes have been wrung out — twisted to remove most of the water. Then they were hung up on poles or clotheslines to air dry, or sometimes just spread out on clean grass. Washing machines and dryers are now fixtures in homes around the world. In some parts of the world, including the USA, Canada, and Switzerland, apartment buildings and dormitories often have laundry rooms, where residents share washing machines and dryers. Usually the machines are set to run only when money is put in a coin slot. In other parts of the world, apartment buildings with laundry rooms are uncommon, and each apartment may have its own washing machine. Those without a machine at home or the use of a laundry room must either wash their clothes by hand or visit a commercial laundromat. A clothes dryer is a household appliance that is used to remove moisture from a load of clothing and other textiles, generally shortly after they are cleaned in a washing machine. Most dryers consist of a rotating drum called a tumbler through which heated air is circulated to evaporate the moisture from the load. The tumbler is rotated relatively slowly in order to maintain space between the articles in the load. In most cases, the tumbler is belt-driven by an induction motor. Using these machines may cause clothes to shrink, become less soft (due to loss of short soft fibers/ lint) and fade. For these reasons, as well as environmental concerns, many people use open air methods such as a clothes line and clotheshorse. Laundry starch is used in the laundering of clothes. Starch was widely used in Europe in the 16th and 17th centuries to stiffen the wide collars and ruffs of fine linen which surrounded the necks of the well-to-do. During the 19th century and early 20th century, it was stylish to stiffen the collars and sleeves of men's shirts and the ruffles of girls' petticoats by applying starch to them as the clean clothes were being ironed. Aside from the smooth, crisp edges it gave to clothing, it served practical purposes as well. Dirt and sweat from a person's neck and wrists would stick to the starch rather than to the fibers of the clothing, and would easily wash away along with the starch. After each laundering, the starch would be reapplied. Today the product is sold in aerosol cans for home use. Kitchen starch used thickening agent for food can also be applied to laundered fabrics (requires boiling). Homemakers that follow predictive maintenance techniques determine the condition of in-service equipment in order to predict when maintenance should be performed. This approach offers cost savings over routine or time-based maintenance, because tasks are performed only when warranted. Homemakers that follow preventive maintenance methods ensure that household equipment and the house are in satisfactory operating condition by providing for inspection, detection, and correction of incipient failures either before they occur or before they develop into major defects. Home maintenance involves the diagnosis and resolution of problems in a home, and is related to home maintenance to avoid such problems. Many types of maintenance are "Do it yourself" (DIY) projects. Maintenance is not necessarily the same as home improvement, although many improvements can result from repairs or maintenance. Often the costs of larger repairs will justify the alternative of investment in full-scale improvements. It may make just as much sense to upgrade a home system (with an improved one) as to repair it or incur ever-more-frequent and expensive maintenance for an inefficient, obsolete or dying system. For a DIY project, also useful is the established limits on time and money investments before a repair (or list of repairs) become overwhelming and discouraging, and less likely to ever be completed. Homemakers that have a lawn responsibility adhere to seasonal lawn care practices, which vary to some extent depending on the climate zone and type of grass that is grown (whether cool season or warm season varieties). Various recognized method used by homemakers in lawn care are observed in any area. In spring or early summer, homemakers seed, sod, or sprig a yard when the ground is warmer. In Summer lawn mowers are used at high cutting for cool season grass, and lower cutting for warm season lawns. In autumn, lawns are mown by homemakers at a lower height and thatch build-up that occurs in warm season grasses are removed. Homemakers do add sandy loam and apply fertilizer, containing some type of wetting agent. Cool season lawns are planted in the autumn with adequate rainfall. Lawn care in the winter is minimal, requiring only light feedings of organic material, such as green-waste compost, and minerals to encourage earthworms and beneficial microbes. Household management by the homemaker is the act of overseeing the organizational, financial, and day-to-day operations of a house or estate. It differs from housekeeping, which consists of the physical maintenance and cleaning of a house. Also common in the U.S are homemaking parties which involve a group of people doing household work instead of hanging out with their friends. House organization or home organization includes interior design which is making the home aesthetically pleasing; and de-cluttering which is removing unnecessary things from the house. Interior design is making the home aesthetically pleasing. Its activities include arranging furniture, having plants inside the house, and more. Household de-cluttering involves putting things in their proper place after they have been used. "Cleaning up your mess" might involve removing glasses or eating utensils from the living room if you have eaten a meal there in front of the television. If several people have done that over a few days and not removed their glasses, dishes and utensils from the living room, the living room is considered to be "cluttered" with dishes. The dishes are out of place because they belong in the kitchen, washed and put away in the cupboards. That is the most common example of clutter in a modern American household. There is another definition of clutter, which refers to having simply too many things and not enough room for all of it. Sometimes as happens in Asian households, the items are necessary, but the house is simply too small, and ingenious methods are needed to organize everything so that unsightly clutter does not result. However, removing unneeded or no longer necessary objects from a household or home is also an aspect of de-cluttering. Objects can be given away to friends or charitable organizations, sold as second-hand, recycled or thrown away. Extreme forms of an inability to de-clutter is a behavioral aspect of compulsive hoarding. On the other end, a society that relies overly much on generating and then disposing of waste is referred to as throw-away society. Household purchasing refers to homemaker's attempt to acquire goods or services to accomplish the goals of the household. Though there are several households that attempt to set standards in the purchasing process, processes can vary greatly between households. Typically the word “purchasing” is not used interchangeably with the word “procurement”, since procurement typically includes other concepts. Home makers decide the market goods that the household will buy, such as the groceries which have been bought at a grocer's. Another important purchase handled by homemakers is the power source used for appliances. Home or other building heating may include boilers, furnaces, and water heaters. Compressed natural gas is used in rural homes without connections to piped-in public utility services, or with portable grills. However, due to being less economical than LPG, LPG (Propane) is the dominant source of rural gas for natural gas-powered ranges and/or ovens, natural gas-heated clothes dryers, heating/cooling and central heating. The amount of usages is determined by factors such as natural gas prices. Homemakers may manage household workers or "domestic workers". domestic consumption work to provide goods and services directly within the household, such as cooking meals, child–care, household repairs, or the manufacture of clothes and gifts. Household work strategies may vary over the life-cycle, as household members age, or with the economic environment; they may be imposed by one person or be decided collectively. Goods and services created at the household level are generally consumed within the country within which they were produced, and hence contribute to "Domestic Consumption". The International Wages for Housework Campaign was a global, social movement co-founded in 1972 in Padua, Italy, by author and activist Selma James. The Campaign was formed to raise awareness of how housework and childcare are the base of all industrial work and to stake the claim that these unavoidable tasks should be compensated as paid, wage labor. 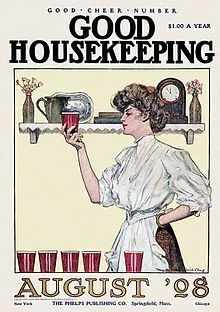 The demands for the Wages for Housework formally called for economic compensation for domestic work but also used these demands to more generally call attention to the affective labors of women, the reliance of capitalist economies on exploitative labor practices against women, and leisure inequality. Utilities can potentially eliminate work like gathering and chopping firewood, shovelling coal, fetching water from outdoors, and heating cold tap water. 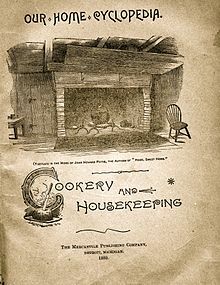 Historian Ruth Schwartz Cowan claims that homemakers in the 1800s performed about 50–60 hours of work per week, and that this is the same as the 1990s. She says that labor-saving devices have been used to make the same amount of time do more work, such as by vacuuming a rug instead of sweeping it, or washing fabrics more frequently. Modern parents also more frequently transport their children to after-school activities, and doctors no longer make house calls. ^ "homemaker - definition of homemaker by The Free Dictionary". Thefreedictionary.com. Retrieved 2015-07-02. ^ a b Swan, Annie S. (2011-04-25). Courtship and Marriage, and the Gentle Art of Home-Making. ^ "Home Economics Archive: Research, Tradition, History". hearth.library.cornell.edu. Retrieved 2019-04-16. ^ Piña, Darlene L.; Bengtson, Vern L. (1993). "The Division of Household Labor and Wives' Happiness: Ideology, Employment, and Perceptions of Support". Journal of Marriage and Family. 55 (4): 901–912. doi:10.2307/352771. ISSN 0022-2445. ^ a b "ScienceDirect". www.sciencedirect.com. Retrieved 2019-04-16. ^ "'Home' - Definitions from Dictionary.com". Dictionary.com. Retrieved 2008-05-08. ^ Ansley, Clark et al. 1935. The Columbia Encyclopedia in One Volume. Morningside Heights, NY: Columbia University Press. ^ Smallin, Donna. 2006. Cleaning Plain & Simple. Storey Publishing, North Adams, MA. ^ Lawn experts are divided in their opinions on this. ^ "Household work strategy". Encyclopedia.com. Retrieved 2015-07-02. ^ Ironmonger, D. (2000-02-02). "Household Production and the Household Economy". Ideas.repec.org. Retrieved 2015-07-02. ^ "Domestic Consumption". Dictionary.cambridge.org. Retrieved 2015-07-02. ^ "More Smiles? More Money". nplusonemag.com. Retrieved 2015-07-02. ^ "No. 1088: Housework". Uh.edu. 2004-08-01. Retrieved 2016-07-07. Lopata, H. Z. (1994). Circles and settings: Role changes of American women. SUNY series in gender and society. Albany: State University of New York Press. "Homemaker" Page 137+. Arnold, E. (1993). Voices of American homemakers. Bloomington: Indiana University Press. Harvey, L. S. (1920). Food facts for the home-maker. Boston: Houghton Mifflin company. Frederick, C. (1919). Household engineering; Scientific management in the home. Chicago: American school of home economics. Snedden, D. (1919). Vocational homemaking education: Some problems and proposals. New York City: Teachers College, Columbia University. Kinne, H., & Cooley, A. M. (1914). Shelter and clothing: A textbook of the household arts. New York: Macmillan. "Friendly Visiting Among the Poor"; by Mary Ellen Richmond. "The Homemaker", Pages 64ff.